Today Microsoft is releasing a new book, The Future Computed: Artificial Intelligence and its role in society. The two of us have written the foreword for the book, and our teams collaborated to write its contents. As the title suggests, the book provides our perspective on where AI technology is going and the new societal issues it has raised. On a personal level, our work on the foreword provided an opportunity to step back and think about how much technology has changed our lives over the past two decades and to consider the changes that are likely to come over the next 20 years. In 1998, we both worked at Microsoft, but on opposite sides of the globe. While we lived on separate continents and in quite different cultures, we shared similar experiences and daily routines which were managed by manual planning and movement. Twenty years later, we take for granted the digital world that was once the stuff of science fiction. Technology – including mobile devices and cloud computing – has fundamentally changed the way we consume news, plan our day, communicate, shop and interact with our family, friends and colleagues. Two decades from now, what will our world look like? At Microsoft, we imagine that artificial intelligence will help us do more with one of our most precious commodities: time. By 2038, personal digital assistants will be trained to anticipate our needs, help manage our schedule, prepare us for meetings, assist as we plan our social lives, reply to and route communications, and drive cars. Beyond our personal lives, AI will enable breakthrough advances in areas like healthcare, agriculture, education and transportation. It’s already happening in impressive ways. But as we’ve witnessed over the past 20 years, new technology also inevitably raises complex questions and broad societal concerns. As we look to a future powered by a partnership between computers and humans, it’s important that we address these challenges head on. How do we ensure that AI is designed and used responsibly? How do we establish ethical principles to protect people? How should we govern its use? And how will AI impact employment and jobs? To answer these tough questions, technologists will need to work closely with government, academia, business, civil society and other stakeholders. At Microsoft, we’ve identified six ethical principles – fairness, reliability and safety, privacy and security, inclusivity, transparency, and accountability – to guide the cross-disciplinary development and use of artificial intelligence. The better we understand these or similar issues — and the more technology developers and users can share best practices to address them — the better served the world will be as we contemplate societal rules to govern AI. We must also pay attention to AI’s impact on workers. What jobs will AI eliminate? What jobs will it create? If there has been one constant over 250 years of technological change, it has been the ongoing impact of technology on jobs — the creation of new jobs, the elimination of existing jobs and the evolution of job tasks and content. This too is certain to continue. Some key conclusions are emerging. First, the companies and countries that will fare best in the AI era will be those that embrace these changes rapidly and effectively. This is because new jobs and economic growth will come to those that embrace the technology, not those that resist or delay adopting it. Second, while we believe that AI will help solve big societal problems, we must look to this future with a critical eye. There will be challenges as well as opportunities. We must address the need for strong ethical principles, the evolution of laws, training for new skills and even labor market reforms. This must all come together if we’re going to make the most of AI. Third, we need to act with a sense of shared responsibility because AI won’t be created by the tech sector alone. At Microsoft we’re working to democratize AI in a manner that’s similar to how we made the PC available to everyone. This means we’re creating tools to make it easy for every developer, business and government to build AI-based solutions and accelerate the benefit to society. All of this leads us to what may be one of the most important conclusions of all. Skilling-up for an AI-powered world involves more than science, technology, engineering and math. As computers behave more like humans, the social sciences and humanities will become even more important. Languages, art, history, economics, ethics, philosophy, psychology and human development courses can teach critical, philosophical and ethics-based skills that will be instrumental in the development and management of AI solutions. If AI is to reach its potential in serving humans, then every engineer will need to learn more about the liberal arts and every liberal arts major will need to learn more about engineering. While we don’t have a crystal ball that shows us the future, we do know that we’re all going to need to spend more time listening to and learning from each other. We hope that The Future Computed can contribute to this conversation. 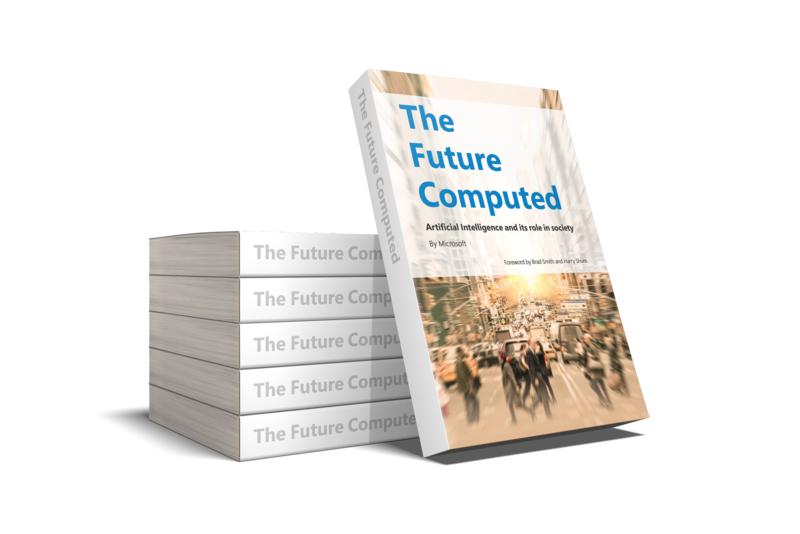 The Future Computed is available here and additional content related to the book can be found here.